Friday fun: what’s your temperament? 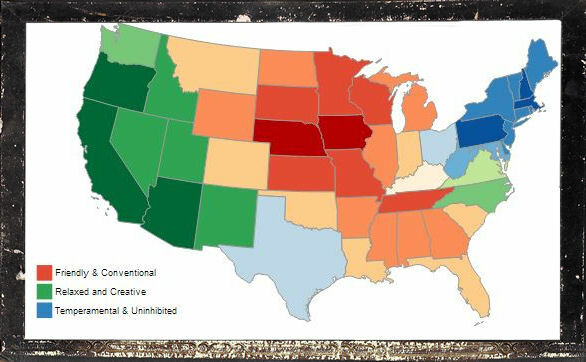 Social scientists have divided the United States into three distinct regions based upon the preponderant personality type: friendly/conventional, relaxed/creative and temperamental/ uninhibited. Virginia and North Carolina represent an isolated, East Coast bastion of the relaxed and creative personality type. The Tarheel state is close to Washington in temperament; Virginia is somewhat diluted version of both. As I read the map, the relaxed-and-creative personality type predominates but not strongly so. Still, our personality mix sets us apart from both the more temperamental Northeast and the more conventional South. How well does your profile fit that of Virginia? Check it out here.